We are glad that you are considering a homemade diet for the special cat or dog in your family. We have more than 100 nutritionally complete recipes to offer, and will customize a recipe if you wish to feed food ingredients not found in our offerings. Our automated online tool allows you to create customized, nutritionally sound homemade diets using minimal supplements for your healthy cat or dog. Recipes are available for downloading immediately after payment and will remain in your account for safe keeping and future reference. Why get a Homemade Diets from us? Want to feed your meat raw? Before getting started, please review the pet requirements and cost information below. To create a homemade diet using our online tool, your pet should meet all 4 conditions. An ideal body weight range is a body condition score (BCS) of 4/9 to 6/9. Use the BCS dog chart or BSC cat Chart to determine your pet's body condition. If your pet is not neutered, you may still use our recipes but may need to feed 10-20% more per day to maintain proper body weight. If your pet has a medical condition, you may wish to consider a one-on-one nutrition consult. 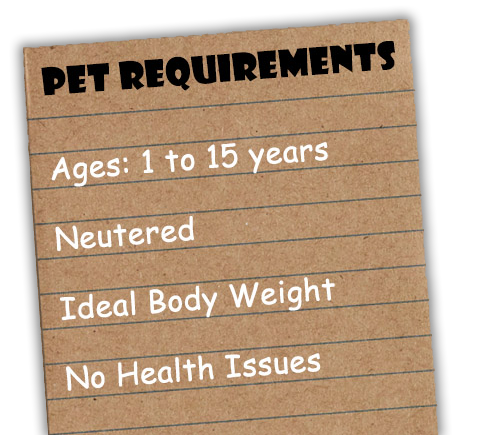 If you are not certain about your pet meeting these requirements, please contact us and a veterinarian will help you make this decision. * To receive this reduced rate, you must purchase all recipes in the same transaction. If you would like more than one recipe, select "continue shopping" after adding a recipe to your cart. Please understand this is a service, not a product, and once you have created the recipe for your pet, we will not refund the fee as the service was performed. Please call us (252.257.1959 ET) if you have any questions and we will make every effort to modify your recipe to your satisfaction. the conditions for using the automated homemade recipe formulation software.